Master Neil Guest met with the Kukkiwon President and officials to discuss technical issues regarding all requirements to be met by British Taekwondo to satisfy Kukkiwon criteria as British Taekwondo is the lead awarding body for Kukkiwon certification in the UK. As a result of this very positive and constructive meeting the following criteria must now be met to satisfy Kukkiwon rules and regulations. On successful completion of a Dan grade promotion the candidates should be awarded a Participation Certificate. The wording of this certificate must not state NATIONAL DAN CERTIFCATE. Only the Kukkiwon are authorised to issue DAN CERTIFICATION. 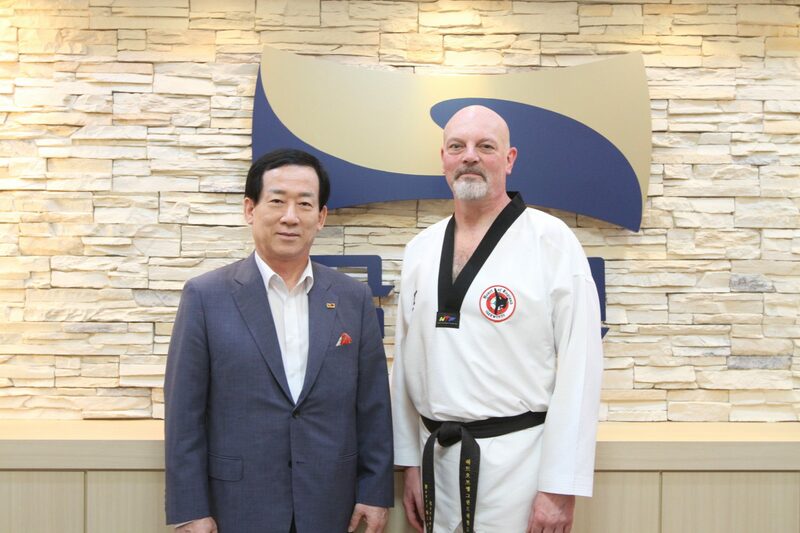 The Chairperson of the Dan grade panel is responsible for the efficient processing of applications to British Taekwondo who will then make the application to Kukkiwon for all Dan/Poom certification. It is the responsibility of the Chairperson to review all applications and manage all issues including if the applicant is time barred. The Chairperson of the Dan grade panel is also responsible that a suitable panel of examiners are selected to meet the criteria set out by the Kukkiwon to accommodate for the grades of the candidates being tested. To promote Candidates to 5th and 6th Dan the Chairperson of the panel and all members must be 7th Dan or above. Club grade promotions may not issue Honorary Dan grade awards or make any dispensations to candidates without the approval of British Taekwondo/Kukkiwon. All Dan grade promotions must be registered with British Taekwondo in advance of the event and all candidates must have a valid British Taekwondo membership.